That last headline is just the latest in a series of articles linking behavioural problems to video games. With the massive popularity of games like Fortnite and Apex Legends, newspapers have picked up a refrain that goes all the way back to the 1990s: that too much time playing video games (or the wrong kinds of games) can have a negative effect on children’s mood and development. There is plenty of anecdotal evidence from parents that it can be difficult to wrench kids away from games and other devices, and that long sessions can make them sulky and irritable. But to what extent does the science back this up? What is the real danger of video games to kids’ development – if any – and what’s the best way to deal with them in your household? Video games have come a long way from Pac-man and Space Invaders. As interest in TV is waning among young people, games are becoming more popular, and achieving huge financial success. Video game revenues in America alone reached $44 billion in 2018, earning more than the entire global movie box office. In the UK meanwhile, games are now worth more than movies and music combined, and around 50% of the population frequently plays some sort of video games, be that on a games console or a mobile phone. Despite this, a line is often drawn between people who enjoy video games casually and ‘gamers’, who consider playing video games to be a pastime. While it’s become more socially acceptable for people of all ages to enjoy gaming, video games do continue to court controversy. Video game violence has been a common tabloid issue going back to Doom in the mid 90s, with accusations that violent games might make people more aggressive. Video game advice for parents meanwhile is patchy, with scare stories in newspapers and viral posts on Facebook often dominating the conversation. The link between video games and violent behaviour has been the subject of numerous studies over the past thirty or so years. In a review of studies published between 2005 and 2013, the American Psychological Association concluded that violent video games did increase aggression among players. However, more than 200 academics subsequently signed an open letter protesting the decision, arguing that many of these studies were not peer-reviewed and contained critical flaws. Most academics agree that playing violent video games can increase aggression in the short-term, in the same way that a competitive sport would get you ‘pumped up’. But there is no hard evidence to suggest that games can have an impact on aggression in the long-term, or directly contribute to real-world violence. The most recent and comprehensive study on the subject by The Royal Society found that there was no link at all between playing violent video games and aggressive behaviour. Debate persists about the effects of video game violence, however, and not without reason. As video game graphics become more realistic, and technologies such as virtual reality make video games more immersive, the potential for them to influence us may increase. The action of using a controller in your lap is sufficiently divorced from reality, but holding a gun-shaped object up to the screen with a virtual reality headset on may make the violence feel truer to life. 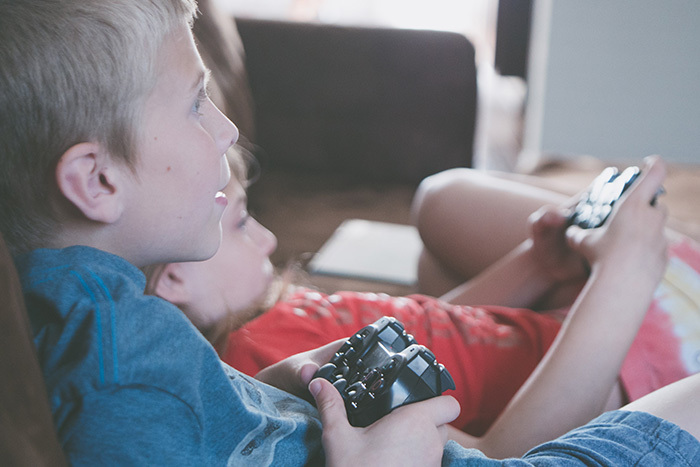 While the link to violence has been largely disproven – much as it was with movies and comic books – the discussion around video games affecting children’s behaviour has moved onto other issues. The last few years have seen accusations of sexism within the industry, and concerns about gambling mechanics within games, which commonly encourage people to pay money to win virtual items. For a long time, video game addiction was not officially classified as a mental illness. This changed in June 2018, when the World Health Organisation put forward a definition of “gaming disorder” for the first time. Simply put, video game addiction is classified in much the same way as other addictions, such as to drugs or alcohol. It is marked by a dependency on playing video games, an inability to stop playing in the face of negative consequences, and prioritising video games over all other activities. While gaming is not as physically harmful as these other addictions, the focus is on the detrimental effect it may have on people’s mental health. What’s the evidence behind video game addiction? Most medical practitioners agree that it is possible to become addicted to video games. Like any other addiction, this can be destructive: there are ‘horror story’ examples of people who reach a breaking point, playing video games to the detriment of sleep, jobs and school. The NHS opened its first internet addiction centre last year with a focus on gaming disorder, while studies of people diagnosed as gaming addicts have found that they tend to be more anxious and depressed than the average player, and that they have worse impulse control. The problem is that until recently, there have been no consistent criteria for judging what makes a person ‘addicted’ to gaming. Spending a long time playing video games does not necessarily mean that you are addicted, any more than a person spending a long time watching TV or listening to music is addicted. Similarly, proposed definitions such as “Deceived family about time spent gaming” or “Gaming to escape negative mood” are too vague to definitively attribute to addiction. While there is plenty of anecdotal evidence, nobody has been able to conclusively prove that video games are physically addictive in the same way as drugs such as alcohol or heroin. Research has found that the ‘pleasure pathways’ in the brain receive a similar rush of dopamine while gaming to eating a slice of pizza or an ice cream; by comparison, drugs such as heroin trigger ten times this level of dopamine. The question is whether the mechanics of video games – which often encourage the player to keep playing for greater rewards – have too much in common with the mechanics of gambling. While the majority of video games are not inherently addictive, there are some games with undeniably addictive qualities. One area of focus for researchers has been the mechanics that certain games use to keep people playing. The concept of the ‘compulsion loop’ – giving the player steady rewards for making progress in the game – has long been recognised as an addictive cycle which feeds our desire for success and progress. This is the same process by which things like fruit machines compel some people to keep spending money, making you think that the next reward is only one more spin away. Loot boxes – randomised ‘treasure chests’ that are bought with real money – have also come under heavy scrutiny by governments worldwide as a form of gambling, and one which is often targeted at children. The outcry in Belgium has been such that EA – makers of the popular football sim FIFA – have withdrawn the game’s virtual currency from sale. The UK government meanwhile has opened a public consultation on the issue, and is currently accepting written evidence from gaming experts, parents and teachers alike. Gaming companies love these small transactions because they generate reliable, long-term income and interest in a game, whose revenue normally tails off within a matter of weeks. Some gamers appreciate them too; things like costumes for your character are often seen as a way to reflect your enjoyment, and give something back to the developers. But others may be compelled to spend more money than they can afford, and get themselves into trouble. While video games and other technologies should not be inoculated from criticism, it’s healthy to be sceptical when tabloids make bold claims about video games affecting children’s behaviour. One story is often picked up by other newspapers, to the point that you think it’s true because it’s everywhere. Yet they are all relying on one source, which in some instances might not turn out to be reliable. This is an increasing problem as newspaper revenues decline, and less money is spent on fact checking. Further investigation found that this author commonly offered cash for stories that fit a particular narrative – and didn’t seem to mind if they were made up. The previous year, an undercover journalist emailed the same author an elaborate fake story about the game Pokemon Go, and the negative effect it had on his marriage. The Mirror writer asked if they could embellish the story further, and imply that the game had forced the couple to break up. Obviously, this is just one incident with one writer, and does not mean that every article is made up. But it does highlight that not all stories in tabloid newspapers are scrutinised to the same degree, and that we should always be critical when we consume media. If the story doesn’t provide sources and evidence that you can follow up on, you probably shouldn’t take it as gospel. While certain media outlets like to play up the negative effects of video games, it’s always good to be informed as a parent, and make choices based on your sense of what is appropriate for your child. Video games employ a rating system similar to movies, which is administered by the European body PEGI. They have recently released a ratings app providing detailed advice on all of their ratings, giving parents an insight into the content of games, and whether they are suitable for their children. The best way to determine the suitability of a game is to play it yourself, or watch somebody else play it. ‘Let’s play’ channels are a popular phenomenon on YouTube, and often feature adult gamers playing through games in their entirety, giving you an insight into the content of a particular game. A few outlets also provide up-to-date video game advice specifically tailored to parents. Popular examples include the UK’s Ask About Games, which is managed by the group that applies PEGI ratings, as well as the independent US-based Common Sense Media. Newspapers such as The Telegraph and The Guardian also provide expert reviews for popular games, which should give you a sense of the content and tone of new releases. Like other new technologies such as social media, it’s worth investigating the effects video games are having on us all. But like violent movies or comic books in the past, there’s also a danger of creating a moral panic about something perfectly harmless. Indeed, a significant body of evidence suggests that making decisions in video games can transfer to real world skills, with gaming improving your decision-making, spacial awareness and pathfinding abilities. Many of us will happily stereotype video games as being a geeky pastime, then boot up Candy Crush on the way to work. Is it much different from calling someone a bookworm because they spend all their evenings reading? And like books, do some gamers play to simply escape from issues in the real world? Some argue that the drop in violent crime over the past two decades has correlated precisely with the growing popularity of violent games, and that they could actually be a catharsis. Video games are broadly violent, and they are designed to take up large amounts of your time, meaning that all of these questions will persist for decades to come. But a majority of people now play video games regularly in some form, and still have many other hobbies, healthy relationships and fulfilling lives. Parents should be mindful of the research, but not drawn into the scare stories. Ultimately, you know your kids best, and it’s up to you to decide what the cut-off point is. « UKATA is now a CITB recognised course provider!